While I was writing, I would often dwell on a curious illustration of Yangon, believed to be from around 1824. In strokes of black ink, you see the Sule Pagoda rising from nothing but swamp and trees. Incredibly, it sits on a small island. A simple footbridge leads to a modest town, population 8,000. To my mind, the story of each building in this city starts with this question: why did the island vanish? Why was the pagoda robbed of its peaceful waters to stand among seven million human lives? A whirlwhind chronology (we offer a proper one) might go something like this: the British took charge in the 1850s. Yangon became Rangoon. By the 1930s, the docks greeted more immigrants than those of New York City. It was a place for Buddhists, Christians, Hindus, Jews and Muslims, and traders from Baghdad to Glasgow. Churches, temples, mosques, stupas, banks and shophouses stretched from the jetties to the Shwedagon. 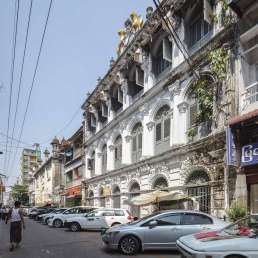 In other words, a colonial master plan was now a place of flesh, steel and brick: hot and bustling streets, in a tight pattern, wove around the lost island from the illustration—by then, a very British roundabout surrounded the Sule Pagoda. The architecture from those high times was loud and bombastic. But with hindsight, even the loftiest British designs look tired, tragic and mistaken today: inside those vast buildings, with their lions (the High Court) or vaulting towers (the Secretariat) a handful of pink and sweaty men thought they could rule forever. Then came the Japanese and a war that shattered the city, prompting one of the largest human exoduses of modern history, as hundreds of thousands of Indian migrants fled west, by foot, clutching their belongings. The greatest symbolic trauma in the country’s collective memory was a single day, 19 July 1947, when Aung San was shot and killed by jealous rivals inside the Secretariat. The man who embodied the spirit of independence was dead. It took place without him. In 1948, the Union Jack descended the Secretariat flagpole. A new flag, representing the Union of Burma, rose in its place. 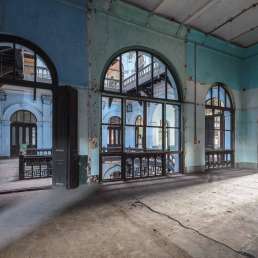 Post-independence architecture evokes the hopes of a second boom in the 1950s. 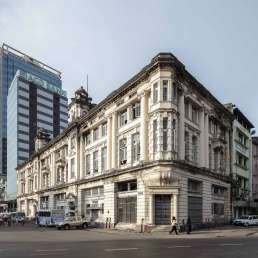 Buildings from those days are self-consciously stripped of colonial conceit, wanting to look resolutely modern—I particularly love the downtown cinemas, the Thamada or Shae Saung, whose façades have lost nothing of their optimism. But that boom never came. Myanmar, and the post-colonial world, were too fragile in the throes of the Cold War. So fragile, in fact, that Yangon was de facto isolated from the rest of the country for long stretches of civil war. Then came 1962, and the dark days of Ne Win. Like poison ivy, barbed wire wrapped around hundreds of buildings. Much of it is still there today, the rusty blades adding yet more historical texture to those fading colonial façades. Several decades of repression followed, rocked by landmark moments of revolt and bloodshed: 1974, 1988, 2007. The military regime mutated over the period. This led, in the eyes of the world, to an “opening-up” of the country in 2011. 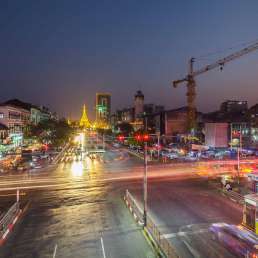 While change is palpable in Yangon, it isn’t so much anywhere else. For one, the army was at war with the country’s dozens of ethnic minority groups for more than 60 years. A draft national ceasefire was signed in April 2015, heralding—perhaps—a lasting peace in the future. Yangon booms again today. Many pavements are still broken, yet along them, boardings promise gleaming new condos for the swelling international class. But the country’s politics remain complicated. Overtures towards democracy seem to lurch—and lurch only—in a fairer direction. And the city dreams again of global stature; many foreign governments and businesses are eyeing Myanmar’s resources. This must come with tangible benefits—better jobs, say, or better health services—for all residents, and not just those in the newest glass towers. I say this because this book has taught me to read pain and injustice on many of the city’s most majestic façades. In their shadow, Yangon’s residents have shown courage and resilience in the face of upheaval, unforgivable violence and terrible natural disasters. This time around they, and Myanmar as a whole, deserve a better deal. Global actors should do business responsibly. They should heed the visible lessons of the past. This city is the shared legacy of tangled nations and kindred cultures. In that sense, it is literally an example to the world: as Thant Myint-U points out in his writings, the expression “plural society” was coined to describe the exceptional mix of colonial Rangoon. And in our world, pluralism is often held to be a good thing in general, and a great thing in a global city. 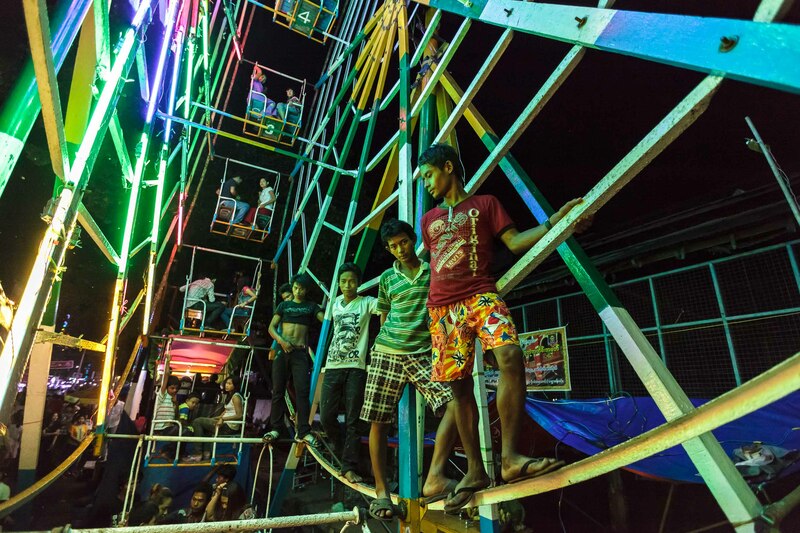 The question is whether, and how, Yangon can thrive and move beyond the darker memories for good. I hope the book helps explore this. To put it another way: it was Clement Attlee, the British prime minister in 1947, who returned the keys to Myanmar’s future. 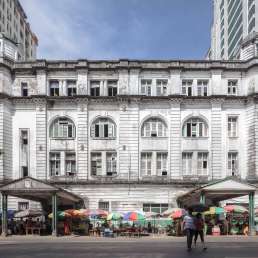 But it was Winston Churchill who inadvertently captured Yangon’s tumultuous magic, so palpable as you—Burmese or foreigner—wander the streets.